KORLOY has released a customized tool series for each dental machine - the T Endmill specialized for machining dental prosthetics. With the acceleration of global aging population increase, dental implants have grown steadily over the last few years. Accordingly, many companies are now actively developing dental CAD/CAM machines, and they compete by developing their own proprietary tool shapes. To meet the demand, the T Endmill helps customers stay ahead of the competition with a customized tool for each machine. There are a variety of materials used for dental prostheses including zirconia, titanium, Co-Cr, wax, PMMA, and more depending on the part for use and purpose. These materials can be roughly divided into three types - half-sintered ceramics, resinous substances, and metallic substances. Each type has different machining characteristics and requires a different solution. 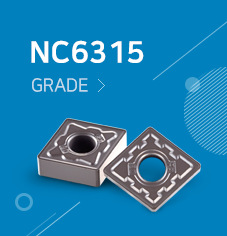 For example, the diamond-coated grade ND3000, with its maximized wear resistance, is highly recommended for zirconia machining; while PC2510, with improved toughness of the tool and wear resistance, delivers excellent machinability against thermal shock when machining metallic workpieces such as titanium and Co-Cr. For machining dental prostheses, surface roughness of the machined workpiece is as important as the tool life. To replace real teeth, crowns made of zirconia require precise dimensions, close tolerance, and excellent surface finish without chipping. The T Endmill can provide exceptional surface finish to machined workpieces due to its optimized ball-point design with evenly ground surfaces. We assure our customers that the T Endmill series are high precision custom tools, delivering superb machinability and high quality manufacturing in various machine applications for dental prostheses.